The Cyclone 150C Trike Scooter offers all the best features into one awesome bike. Standard with power disc brakes, electric start, a bright light system, automatic CVT transmission and more. 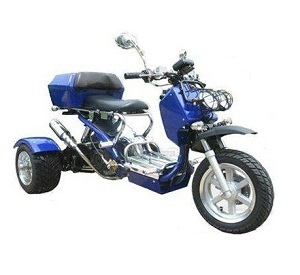 The Cyclone offers a rugged, all steel frame that can carry over 350 pounds and tow up to 110 pounds, and the smooth full front and rear suspension makes riding easy. The extra large size frame can handle two riders ease. The Cyclone also features a digital speedometer, a large, wrap-around fairing made of rugged ABS for long-lasting durability. 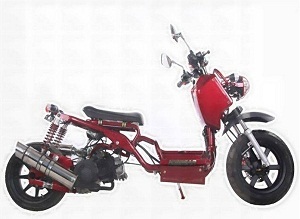 The air cooled engine is long lasting and provides enough power to push the trike up to 55 MPH. 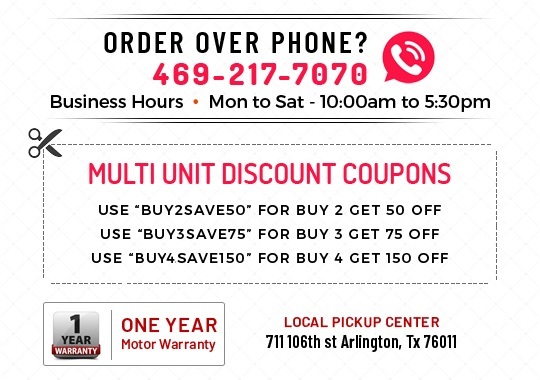 With an over-size 3.4 gallon fuel tank and great mileage up to 70mpg, you can ride long distances without filling up! 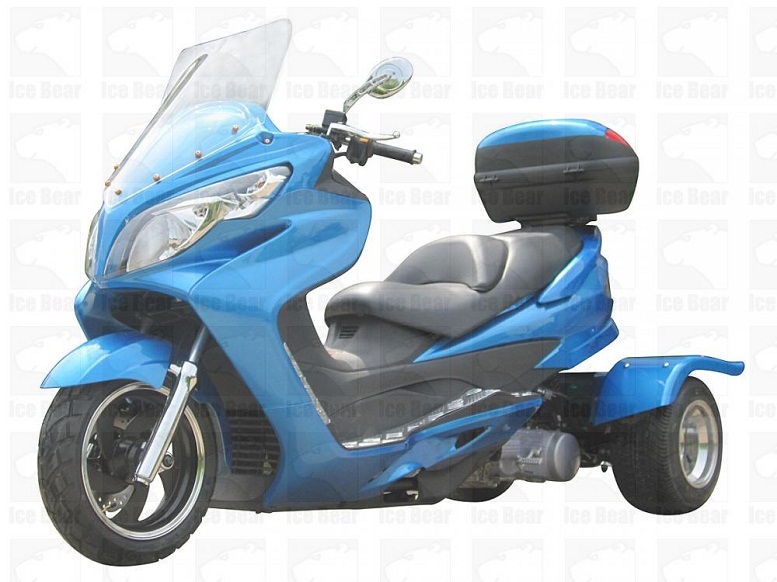 The Stylish 150cc 4-Stroke, Three Wheel Trike – Ultra Body - Style Trike that is out of the ordinary and delivers great style and performance at a low price. 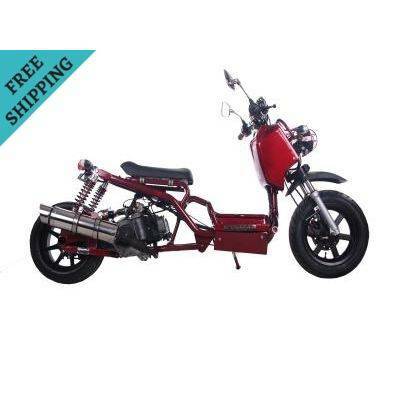 This Trike is the ultimate ride that will re-define style and performance on the open road, whether you take it on a daily commute or on a fun ride, you will enjoy every moment. 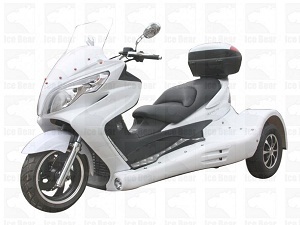 With a unique styling that is different from other motorcyles, this Trike is not only noticeable and fashionable but also aerodynamic and fast. 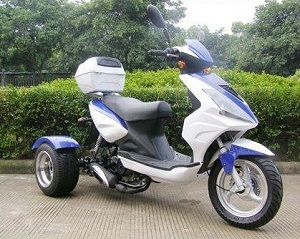 The MTB-20 Three Wheel Bike/ Trike is powered by a 150cc, single cylinder, 4-Stroke Air Cooled Engine. 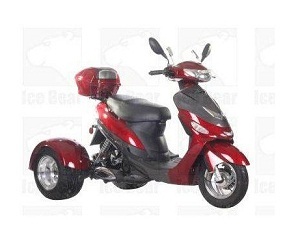 The MTB-20 is a Fun Trike custom built under very strict quality control and comes with Free Manufacturer warranty. 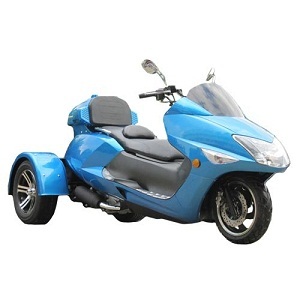 The MTB-20 Trike is very fuel efficient and can deliver up to 80 miles/Gallon with speeds to 50+mph. 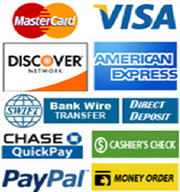 Overall Length (inches):99.6" / Overall Width (inches):42.1" / Overall Height (inches):43.3"